Free shipping to ANY address is the US! Orders shipped within 24 business hours! No minimum order! No handling fees! No store pickup! No sales tax! The advertised price is the delivered price! Click on product to order. Pull down "Version" on item page to receive the version you need. Individual CMS 1500 sheets. Printed OCR red ink both sides as required by CMS. Suitable for hand completion and compatible with all inkjet and laser printers. Click on product to order! These are individual sets. They are 2 sheets glued together at the top of the form to make a set. They are not continuous forms that you have to tear apart. 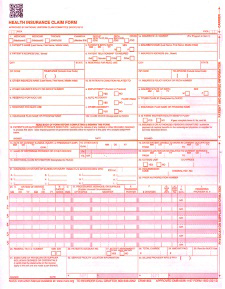 When you fill out the form, a copy is made on the second bottom sheet for you to keep for your files. Click on the product to order! We ship within 1 business day of receiving your paid order. You need to allow 2-5 business days delivery time additional for shipping transit time after that to receive your order - depending where you are in the US. We ship from Florida. Most of the time we actually ship the same day and usually you receive your order in 2 business days after the day of shipping. However, since we ship to so many people in so many areas, we can't make that blanket promise to everyone. Florida residents - we pay your sales tax. We guarantee your complete satisfaction and guarantee them to be acceptable to Medicare and Medicaid and all insurers who accept health insurance claims using the CMS 1500 Claim Form. If you are not satisifed we will refund you money including shipping. Completing your CMS 1500 Claim Forms by hand? Personalizing your CMS 1500 Claim Forms saves you time in completeing the claim as well as reducing rejections due to clerical errors or typos. Personalization costs less than you think. Generally it costs only about 3 cents additional per claim to prefill your claim form with your practice information. You can include as much - or as little - information as you want. Click the "Personalization" tab above for more information!